The Royal Norwegian Navy was dealt a devastating blow in the early morning hours of November 10 when one of its five capital Nansen-class frigates collided with a fully loaded oil tanker more than 10 times its size while returning NATO’s Trident Juncture exercise. 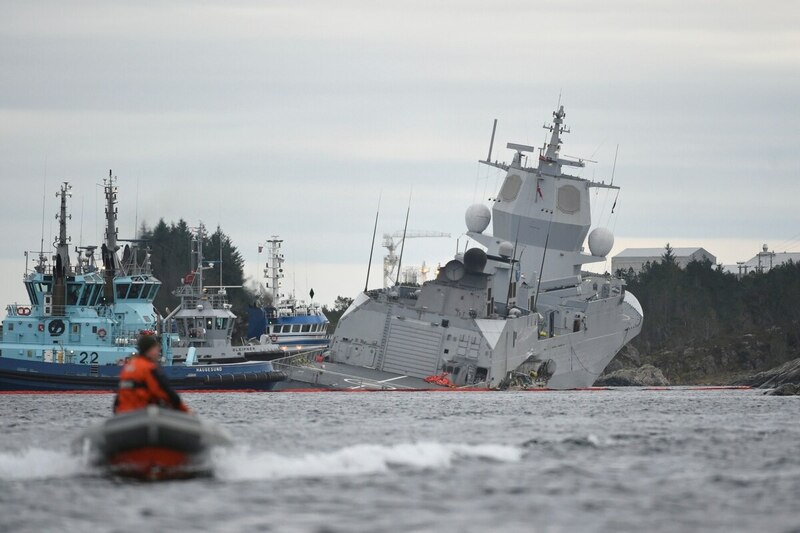 The frigate Helge Ingstad lost steering and drifted at five knots onto the rocky shore near Norwegian port of Sture, north of Bergen, saving the ship from sinking in the Fjord, according to media reports. The crew of 137 was forced to abandon ship. Ingstad is now resting on its side on three points while crews move to secure it. “This is a huge blow to the Norwegian navy,” said Sebastian Bruns, who heads the Center for Maritime Strategy and Security at the University of Kiel in northern Germany. The loss of the $400 million ship, which appeared likely, leaves the Norwegian Navy with a 20 percent cut to its most advanced class of ship, Burns said. The situation is made all the more painful as evidence mounts that Ingstad was repeatedly warned to alter course before the collision and failed to take corrective action to avoid the collision. Local media reported that the Maltese-flagged tanker Sola TS identified Ingstad and tried to avoid the disaster. The reports also revealed details that show that Ingstad did not have a firm grasp of the surface picture it was sailing into. The disaster developed quickly, with Ingstad transiting the channel inbound at 17 knots and Sola TS traveling outbound at 7 knots. Sola TS raised the Ingstad multiple times and was discussing the emerging danger with shore-based Central Station, according to the Norwegian paper Verdens Gang. The responses from Ingstad appear confused, at one point saying that if they altered the course it would take them too close to the shoals, which prompted Sola TS to respond that they had to do something or a collision would be unavoidable. The Norwegian military has repeatedly declined to comment on the sequence of events, citing an ongoing investigation by an accident investigation panel. While much remains unknown about the collision details, the extent of the damage to the Ingstad appeared consistent with the sheer size mismatch between the tanker and the warship, several European subject matter experts noted. According to the shipping site Marine Traffic, the Sola TS when carrying its full load of crude oil displaces about 113,000 tons more than a U.S. aircraft carrier, and even when empty displaces 10 times as much as Helge Ingstad. Warships typically are constructed of thinner metal than commercial workhorses because they need more speed and maneuverability in combat. What appears to have worked well in the aftermath of the collision is rushing all sailors to safety, said Bruns. That could well have something to do with a years-old trend among some European navies of adapting ship designs and crew procedures to so-called low-intensity operations, which includes fighting pirates and smugglers, and rescuing migrants in distress at sea. A German shipbuilding executive noted a size difference between U.S. Navy ships, which tend to be bigger, and European models used for similar missions. In addition, “the Americans generally still build with more massive steel,” the executive added. Crews are in the process of securing the Ingstad with cables to the shore, and once they are sure the ship wont drift away and sink, the Navy will be able to get their people on board, according to the Norwegian paper Aftenposten. Radio transmissions from Ingstad indicated that the Sola TS ripped a huge hole in the engine room, VG reported. Once crews are on board, the Navy will assess the level of damage to the ship, the Navy told Aftenposten. The plan as it stands will be to see if the hole can be sealed up and the spaces dewatered, then the ship will be lifted on to a barge and brought to the Norwegian Navy base at Haakonsvern. The ship is carrying weapons that will be offloaded once it is safely on a barge, the Navy told Aftenposten. Meanwhile, the Sola TS was cleared to leave Norway after being questioned by police and investigators and was in Britain on Saturday, Aftenposten reported.